I can still hear it ringing in my ears, the sound of Dean Baquet, executive editor of The New York Times, admitting that his paper doesn’t “get religion.” That was on December 8. On December 13, The Times published an op-ed piece on the religious views of Betsy DeVos, Donald Trump’s choice for secretary of education. To the surprise of no one, it was a hatchet job. The piece was juicy and salacious, incredulous and condescending. It opened with a caricature of DeVos as the champion of an extreme fringe of the religious right, but not before insulting Jerry Falwell Jr. and Liberty University for ignorantly espousing the Christian belief that God actually created the world. More witch-hunt than editorial, author Katherine Stewart culls DeVos’s supposed offenses including her family’s fortune and business ties, her philanthropic activity, and most notably her religiously motivated political activism. With the equanimity of a Roman Candle, Stewart depicts DeVos’s approach to education reform as an existential threat to the republic. For what reason? Because DeVos and her husband, Richard DeVos Jr., have the audacity to claim that their efforts to improve the state of public education—promoting things like school choice and subsidiarity—flow out of their Christian faith. Stewart classifies this as an “apocalyptic conviction.” We’re supposed to be in alarm because Devos has “singled out education reform as a way to ‘advance God’s kingdom.’ In an interview, she and her husband, Richard DeVos Jr., said that school choice would lead to ‘greater kingdom gain.’” This draws out the fundamental point. Progressives don’t get religion. Stewart’s op-ed is an exercise in fear-mongering. Far from debating the merits of DeVos’s support of vouchers and charter schools, Stewart’s words elicit panic that Trump’s nominee is a religious zealot who intends to Christianize public education. This misses the point entirely. Stewart is troubled by the fact that DeVos’s religion animates her political work, but fails to comprehend what that even means. It’s true. The DeVoses actually view their work as service to God. Although, as Stewart claims, this may appear “radical” or “extreme” to secularists and progressives, this is the very essence of what it means to be religious. DeVos’s tightly excerpted phrases here, to Christian ears, also do not indicate she wants to, say, establish a theocracy, but is a common way Christians speak of acting out their faith by serving others. One can hardly imagine a more timely demonstration of Baquet’s point. But is it true that this idea—DeVos’s religious beliefs influence her approach to education and public policy—represents an “immediate threat” to public education in America? Apparently, at least for some. In Stewart’s reckoning, public education is a purely secular affair, and DeVos’s religious commitments violate this principle Stewart regards as sacrosanct. Even more, it violates the Constitution. But this is fantasy masquerading as fact. There’s no such thing as neutral. A person’s most deeply held beliefs—one’s values and ultimate viewpoints—necessarily shape and inform everything he or she does. This is as true for atheists as it is for Christians. If Stewart insists that secularism is the only acceptable approach to government—as evidenced by her claim that the “Christian right” threatens not only public education, but a number of public institutions under the Trump administration—then the real question is this: is Stewart actually suggesting that we impose a religious test upon public servants? Consider the nature of the reforms DeVos supports. She has long advocated for and put large sums of money behind initiatives to give groups of parents and teachers the ability to run local public schools, called charter schools. These are all entirely public schools that are forbidden from teaching religion (yet free, like all public schools, to teach the anti-religious views of secular humanism). Does this sound like “turning the United States into a Christian republic subject to ‘biblical laws’”? Given that the Bible specifically commands parents to pass on their faith to their children, and charter schools are explicitly forbidden from participating in this, it’s hard to see how. 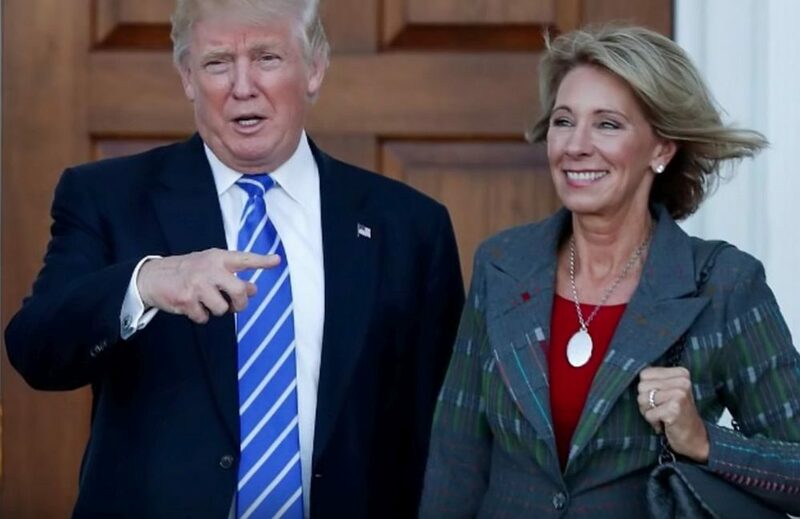 DeVos is also a proponent of school voucher programs, while the Obama administration has used existing voucher-like federal programs that pay for for lunch and busing to private schools to demand that these schools eradicate all manifestations of their faith regarding human sexuality. It attempted to use the funding lever to force Christian schools to end sexual ethics agreements and admit boys to girls’ bathrooms. Rather than calling the potentiality of federalized vouchers a “general assault on public education” that heralds a Christian theocracy, Stewart might instead see it as an excellent way to push religious schools to align with her anti-religious political preferences. This aside, research also shows that state- or locally run school voucher programs tend to increase religious and political tolerance better than public schools. One major theory about why suggests it’s because allowing people to be honest about and pursue their deepest beliefs gives them empathy for people who have different core beliefs. They are better able to put themselves in other people’s shoes and voluntarily, rather than being forced to negotiate religious disagreements through the political system, like public schools now require. What politicizes and increases conflicts in education is running it through a central government monopoly rather than decentralizing it to let the education families choose align with rather than contradict their core beliefs. Stewart also attempts to peg DeVos as hate-filled and bigoted, and to disparage the Christian right’s “conservative agenda” as both “extremist” and “anti-L.G.B.T.” But again she misses the mark, failing to offer substantive criticism of DeVos or the religious right and instead substituting fact-less, anti-religious smears. A DeVos advisor who is a gay man says she supported him at a time when it was politically dangerous to do so on the Right, protecting his sexuality from public disclosure before he was comfortable with that. She also publicly opposed amending Michigan’s constitution to define marriage as between one man and one woman. That doesn’t sound like anti-gay bigotry to me. As Stewart mocks and caricatures Christian conservatives, she fails to engage their ideas. That is unfortunate, considering that these views will determine the future of the U.S. Department of Education. There is no doubt that a left-leaning journalist could find much to criticize concerning DeVos’s objectives for reform. But alarmist rhetoric about her faith is as vacuous as the echo chamber it was composed in. To put it plainly, there is no scandal here. Stewart quotes evangelical pastor D. James Kennedy: “in 2005, he told followers to ‘exercise godly dominion’ over ‘every aspect and institution of human society,’ including the government.” With contempt, Stewart notes that Kennedy’s ministry received support from the DeVos family and hints at a nefarious plot to install a Christian government. But for religious conservatives, seeking to “advance God’s kingdom” signals no effort to establish a theocratic state or subject Americans to “biblical laws.” The exercise of godly authority has everything to do with defending human rights, protecting the vulnerable, and recognizing the dignity of every person. Exactly why that is so damning remains a mystery. In fairness to Baquet, I recognize that he doesn’t oversee opinion pieces. We all also agree that publishing critical commentary is an essential part of journalism. But no one is refreshing The New York Times’s opinion page in hopes of finding a more conservative take. Articles like this are what we’ve come to expect from the Times and other elite media outlets. They don’t get religion, but maybe they should try.